No one has scored more goals in the AHL than Greg Carey with 84 in the last three seasons. The next-closest competition is Grand Rapids Griffins forward and Philadelphia native Eric Tangradi, who has 74 goals. His 30 goals this season are the most in Lehigh Valley Phantoms history since relocating to the area four seasons ago. He is also the first to score 30-plus goals in the franchise’s history since Jon Matsumoto (30) did it back in 2009-10 for the Adirondack Phantoms. So, what does the 27-year-old Carey think makes a good goal scorer? He had the answer to that in a recent interview with The Hockey Writers. 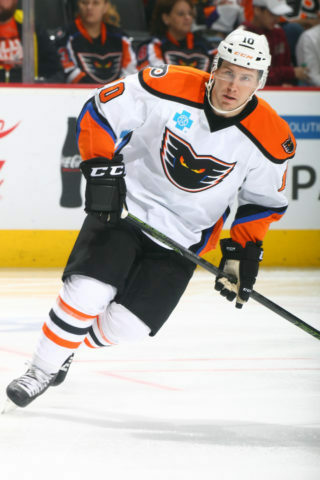 Going undrafted, he was a highly-touted college free agent, signing a contract with the Arizona Coyotes in March 2014 and reported right away to their AHL team, the Portland Pirates. After an unsuccessful rookie season that saw him play in both the AHL and ECHL, he was not tendered a qualifying offer but that just motivated Carey more. More like Philadelphia was fortunate to acquire Carey’s goal-scoring services. In the 141 games played in Lehigh Valley’s last two seasons, Carey has nine game-winning goals, 25 power-play goals, and eight first goals, while taking 400 shots on goal. Carey was rewarded with a two-year contract extension on Mar. 8, 2017, which allowed him to set up some roots in the area. “I lived in Lehigh Valley last summer with my fiance. I really liked the area, the people, the fans are awesome. I mean, they take care of us. I feel like we get treated like an NHL team, with their facilities and everything they really do take care of us and they kind of treated us like family,” Carey said. The Hamilton Howitzer – @careygreg10 – strikes again! Off the ice, Carey is an avid golfer. He credits his father, Alan, for getting him into the game and who, now retired, works at a golf course allowing for easy access to playing during the offseason. Another one of his hobbies is talking and watching all things superheroes. His favorite superhero is Batman and is a big fan of Christian Bale’s portrayal, but he doesn’t mind Ben Affleck’s depiction because, “he looks like Batman: big and scary.” Interesting, because this is most likely the way goaltenders are describing Greg Carey’s shot: big and scary.